Originating from a simple family, Muhammad uphold and propagate one of the world's largest religion, Islam. And at the same time appear as a strong leader, genuine, and effective. Now, thirteen centuries after his death, his influence is still strong and deep and rooted. Most of the people listed in this book is a lucky creature was born and raised in centers of human civilization, cultural and place high political circles of the nations. Muhammad was born in the year 570 AD, the city of Mecca, in the little southern Arabian Peninsula, a place that time was the most backward regions in the world, far from the center of commerce, art and science. Became an orphan at the age of six, grew up in a situation around a simple and humble. Islamic sources say that Muhamnmad an illiterate. The new economic situation began to improve at the age of twenty-five years old when he married a widow resides. However, until near the age of forty years barely visible clues keluarbiasaannya as human beings. Generally, the Arabs at that time did not embrace any particular religion but a pagan Mecca in the town there are a small number of adherents-adherents of Judaism and Christianity, and the greater the likelihood of Muhammad for the first time they heard about the existence of an Almighty God, who set up throughout nature. When he was forty years old, Muhammad believed that God Almighty is to communicate something to him and chose to be a disseminator of right belief. During the three years just to spread the religion of Muhammad is limited to close friends and relatives. 613 when entering the new year he began performing in public. Once he got a little follower, ruler of Mecca looked at him as a dangerous, trouble maker. In the year 622, worried about his safety, Muhammad fled to Medina, the city is 200 miles north of Mecca. In that city he was offered a position of political power that is quite convincing. This migration event is an important turning point for the life of the Prophet. In Mecca he was difficult to obtain a small number of followers, and in Medina followers growing at a brisk pace so that he can get the effect that makes it a real power holders. In the following years while the followers of Muhammad grew like a mushroom, a spate of fighting broke out between Mektah and Medina. This war ended in 630 with Muhammad's victory at the party, returned to Mecca as conqueror. The remaining two and a half years of his life he witnessed tremendous progress in terms of rapid Arab tribes embraced Islam. And when Muhammad died in 632, he had established himself as an effective authority throughout the south of the Arabian Peninsula. Bedewi tribes have a tradition passed down through generations as the soldiers are tough and brave. But their numbers are not a lot and always tempted to divide and confront each other with each other. That's why they can not outperform the soldiers of the kingdoms established in the agricultural areas in the northern hemisphere. However, Muhammad's first person in history, thanks to strong confidence boost to the oneness of God, the small Arab force capable of an astonishing series of conquests in human history. In northeastern New Arab Persian Sassanids established an empire at large. In northwestern Arabia stand Byzantine or Eastern Roman Empire with Constantinople as its center. Judging from the number and size of the corner, obviously would not be able to deal with Arabs. However, in the field of battle, Arab soldiers with a burning zeal to conquer Mesopotamia lightning strokes, Syrians, and Palestinians. In 642 Egypt was taken from the hands of the Byzantine Empire, and while the Persian army was beaten in the battle which was crucial in Qadisiya in 637 and 642 in Nehavend year. However, large-scale conquest - under the leadership of the Prophet's companions and his successor Abu Bakr and Umar ibn al-Khattab - did not show signs stop there. In 711, Arab armies swept out of North Africa up to the edge of the Atlantic Ocean. From there they turned north and crossed the Strait of Gibraltar and berated the Visigothic kingdom in Spain. At first glance one should think the Muslims would chop up all the Christians of Europe. But in the year 732, in the famous and terrible battle at Tours, a Muslim army that had advanced to the center of the country were beaten by France at the end of the Franks. Even so, only within secuwil century battle, the people of this Bedewi-imbued with the sayings of the Prophet Muhammad had established an empire stretching from the borders of India to the white sand beach of the Atlantic Ocean, the largest empire ever known to human history. And wherever conquest by Muslim armies, always followed by a flock in. bondongnya adherents of Islam. Apparently, not all conquest is permanent. The Persians, though still faithful adherents of Islam, regained its independence from Arab hands. And in Spain, after over seven centuries of warfare finally defeated by the Christians. Meanwhile, Mesopotamia and Egypt, the birthplace of two ancient cultures, remained in Arab hands as well as the entire northern coast of Africa. 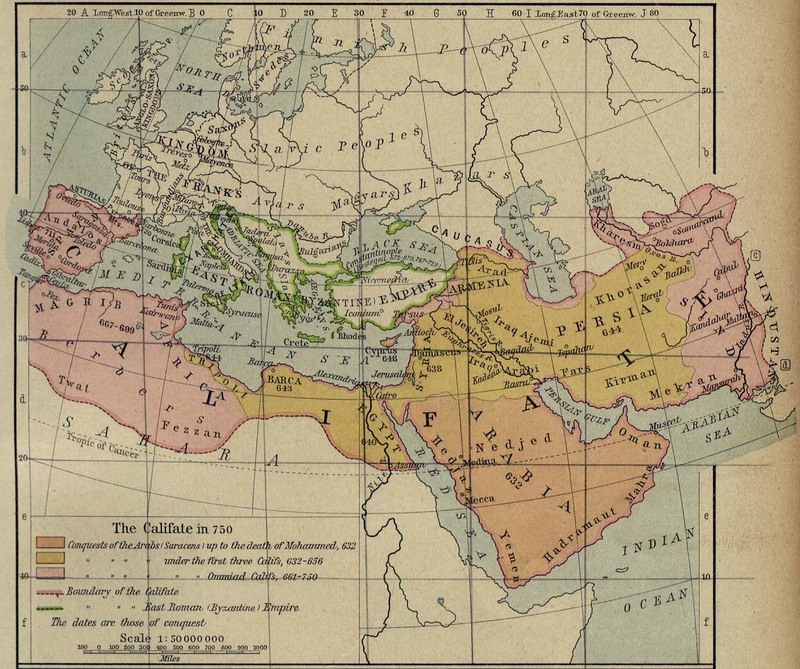 Islam, of course, continue to spread from one century to another century, stepped away from the conquered areas. Millions of followers of Islam are generally scattered in Africa, Central Asia, especially Pakistan and northern India and Indonesia. In Indonesia, the new Islamic religion is a unifying factor. In the Indian subcontinent, almost the opposite: the new religion was a major cause of the break. Is the influence of the Prophet Muhammad the most basic to the history of mankind? As with other religions, Islam has an enormous effect on its adherents. That is why the spreader-spreader all the major religions of the world can place in this book. If measured by the number, the number of adherents of Christianity twice the size of the adherents of Islam, by itself arises what is the reason to put a question mark Prophet Muhammad order higher than that of the Prophet Jesus in the list. There are two main reasons that so my grip. First, Muhammad played a far more important role in the development of the role of Islam than Jesus of Christian Religion. Even Jesus is responsible for the basic teachings of Christian morals and ethics (to a certain extent different from Judaism), St. Petersburg. Paul is the main disseminator of Christian theology figures, figures penyebarnya, and author of the greatest part of the Old Testament. Instead Muhammad was not only responsible for the theology of Islam but it also points to the ethical and moral. In addition he was "recording" the Scripture of the Koran, a collection of revelations to Muhammad that he believed came directly from God. The vast majority of this revelation was copied with great earnestness during Muhammad's life and then collected in a form that does not tergoyangkan shortly after he died. Al-Quran is thus closely related to the views of Muhammad and his teachings because he relied on God's revelation. In contrast, none of which are so detailed collection of the teachings of Jesus, which still can be found in the present. Because the Al-Quran for Muslims to some extent as important as the Bible for Christians, the influence of Muhammad through the medium of the Koran teramatlah magnitude. Possible influence of Muhammad in Islam is greater than the influence of Jesus and St. Paul Christian in the world combined. Measured from the purely religious angle, it seems that the effect Muhammad Isa equivalent in the history of humanity. Furthermore (in contrast to Isa) Muhammad is not simply a religious leader but also the natural leader. The fact is, as the driving force of the motion which carried the Arab conquest, the influence of political leadership is in the forefront all the time. Of various historical events, one might say it could happen without the leadership of someone special who heads them. For example, the colonies in South America might be able to free themselves from Spanish colonialism while Simon Bolivar had never existed in the world. However, this example does not apply to the motion which carried out the conquest of the Arabs. There was no similar incidents before Muhammad and there is no reason to deny that conquest can occur and succeed without Muhammad. The only similarity in terms of conquests in human history in the 13th century the most basic part thanks to the influence of Genghis Khan. This conquest, although wider scope than what the Arab nation, it is not able to prove the establishment, and now the only areas occupied by the Mongols was the same area before the time of Genghis Khan. This clearly shows a big difference with the conquest by the Arabs. Stretching from Iraq to Morocco, extending the chain of Arab nations united not merely a fad thanks to the Islamic religion but also from the Department of Arabic language, history and culture. The central position of Al-Quran among Muslims and written in Arabic, is the likely reason why the Arabic language are not divided into dialects, which berantarakan. If not, probably would have happened in the century to l3. Difference and division in the Arab countries would happen, of course, and in fact did so, but divisions that are in parts that do not necessarily make us negligent that their union is still tangible. However, both Iran and Indonesia are both populous Muslim country and both the oil, did not join in the attitude of the oil embargo in the winter of 1973 to 1974. Instead of goods is not a coincidence that all Arab countries, only Arab country, which take the oil embargo. Thus, we may see, which made the conquest of the Arabs in the 7th century continue to play an important role in the history of mankind today. I rate this in terms of the incomparable combination between their religion and worldly terms attached to the influence of Muhammad himself, so I think Muhammad was a private in the sense of the most influential man in human history.